Desktop Aquarium shows a beautiful, REAL aquarium on your desktop. 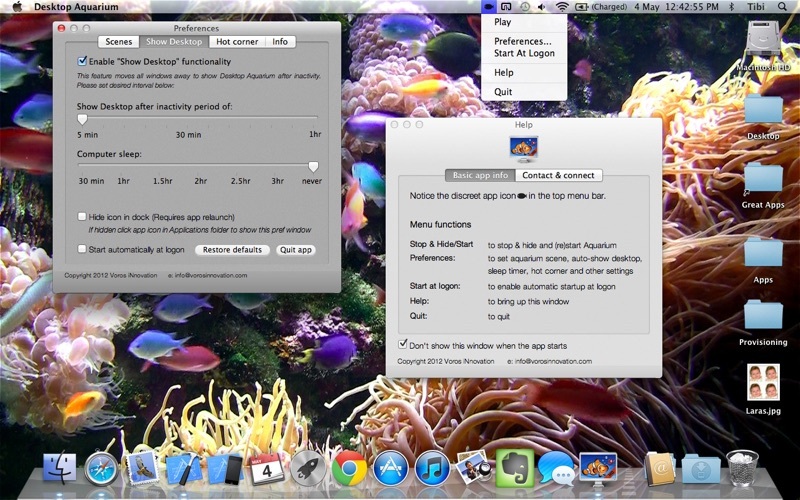 It features: + Beautiful Coral Reef and Shark Paradise scenes + Real videos, no fake computer animated fish + Shows Desktop* after a preset period of inactivity (moves all windows out of view) + Hot corner support to "Show Desktop"* + Scenes can be set to start based on how much desktop area is covered. + Both dock icon and menubar icon can be hidden. ** *make sure the "show desktop" shortcut is enabled in Keyboard Preferences. It is enabled by default on all Macs **reopening the app from Launchpad or Applications folder will open app preferences. Limitations: + FREE version videos are 10x shorter than in full version + FREE version: 30 second videos, shows occasional popup ads + FULL version: 6-10 minute videos, no ads Note: All videos are in HD+ resolution and optimised for 13'', 15'' and 17'' screens. It always freezes. What is a fish tank if the fish don't move????? it’s nice and peaceful and the fish don’t die. Its okay but i don’t stare at my computer all day and daydream. This makes the constant pop-ups for me to purchase the full version and countless other products completely unworthy of my time. Unistalling. 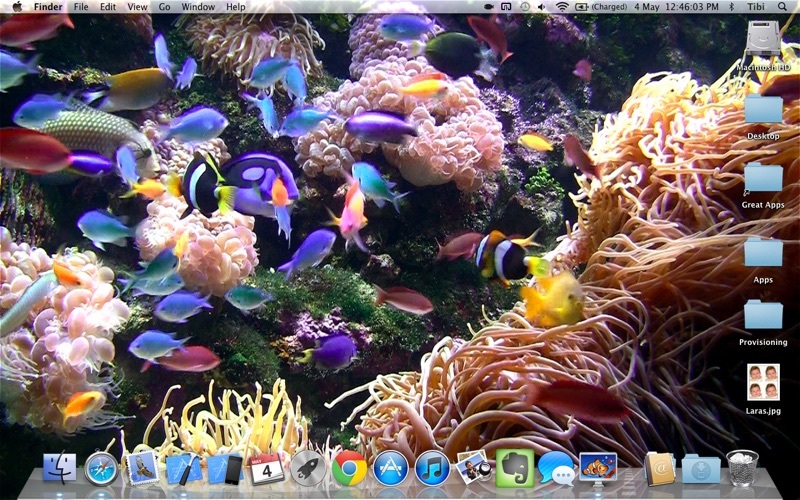 I love how my desktop has moving fish on it. It makes my computer come alive, especially with colorful beautiful fish! Not bad, it is a bit frenzied at times, like a shark is coming to eat the fish! But I enjoy it and as long as you don’t sit there and stare at it, it is nice to have in the background. Needs option to slow down the movement and reduce number of fish. Not relaxing, too hyper. I am surprised by how many people seem to like this but beauty is in the eye of the beholder as the old saying goes I suppose. I rate this app with one star because it is simply displaying a poorly made video and thus it is not possible to control anything displayed such as the ridiculous number of fish and the high speed at which they are swimming about. Too much of a good thing is not always a good thing. Nobody would ever crowd a fish tank like this I hope. Nobody would ever dump copious amounts of caffeine in there either causing the fish to lose thier minds and swim about at high speed experiencing panic attacks that just won’t quit. Those poor little fishies! I could not bear to watch this for long. Another problem with just looping a short video is there is no randomness to the fishtank. Worst of all, unless the native resolution of your display just happens to be 720p, the visual quality which does not appear to have been very good to begin with degrades further. At 1440p on my 27” iMac this looks terrible and I am not usually that fussy. For example, I enjoy classic games with looks that are nothing to write home to mom about. The free version notes in its options I think it was that upgrading would remove intrusive ads that pop up. I did not stick around long enough to see one of these myself. I know it is free and I am being hard on this one but I am just being honest. I think Apple needs to set a little higher bar regarding what it will permit to even appear on the App Store myself. This shouldn’t have made it past review. I really like the aquarium desk top because its like having my very own live aquarium with out any mess, its absolutely beautiful i love it! !!!! I love the color, the movements of the fish. It keeps my screen alive & well. Keep up the good work techies. 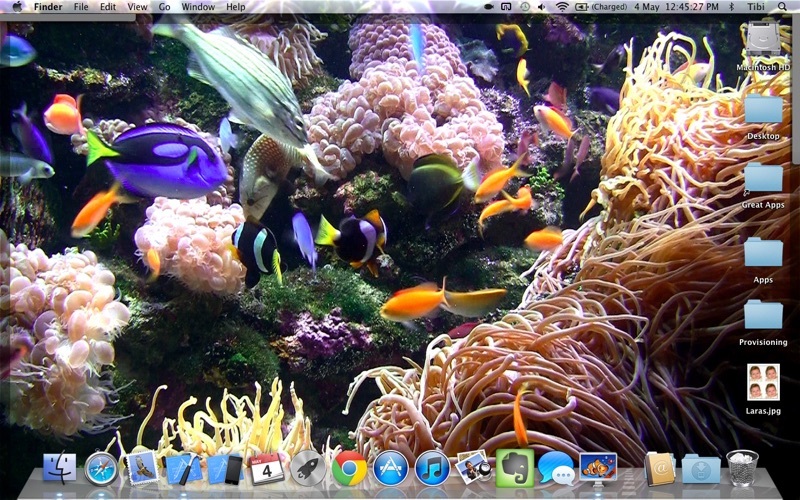 There is never a boring minute looking at my Desktop Aquarium free screensaver. The colors, aquatic movement, and coral is soothing and calming. I picture myself scuba diving in the Caribbean for conch shells. Great stress reliever! The colorful beauty of the tropical fish is relaxing and enjoyable to view. Anyone who finds this picturesque wonder under the sea a distraction should step back, take a deep breath, and take in the warmth and beauty this scene projects. Not calming, TOO HYPER for me. 1. Not calming: The fish behave as if they are eluding an attack. Not only do they swim rapidly but also irratically. More than once a school will suddenly jerk as if a predator has attempted attack. 2. Not calming: There are too many fish in this aquarium. To the viewer there is too much visual stimulation. One can tell videos of different fish have been overlapped, as in reality this over-population of fish would result in the death of most of them. 3. Not calming: Too busy of a background. Some background of rocks and anemone with a neutral backdrop above the hardscape would do in order to better visualize the swimming movement of each fish; allowing a more relaxing experience for the viewer. Bottomline: I moved the app to the Trash. Isn't calm the affect this app is meant to instill? Not for me. I would not recommend downloading the screen saver because of an annoying prompts that is often so hard to get rid of. I had to remove it from my hard drive. I can not get over how realistic this is!! 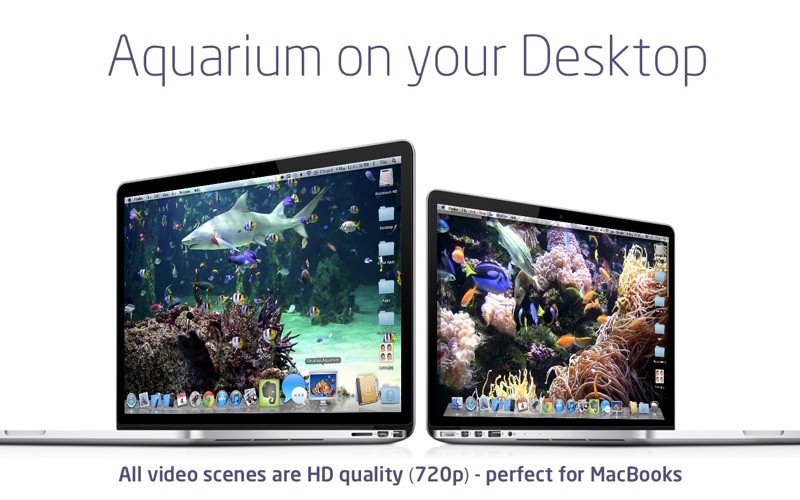 It really is like having my very own aquarium and fish in my office, on my 27 inch iMac screen. I find myself staring and watching, several minutes at a time. Thank you so much for improving my every day, with your genius, this is so wonderful!! I was looking for a peaceful and serene aquarium for my desktop. 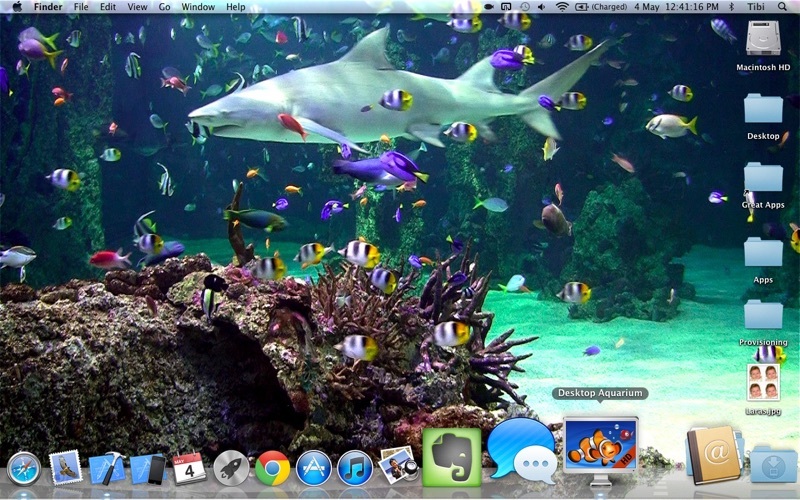 I dowloaded Deskyop Auarium (free) and oh my, way to busy of an aquarium for one’s desktop. Half the time I could not locate my cursor as there was so much fish activity going on. I finally deleted it completely. beautiful colors and very relaxing and healing !! I love this app ( i have the free version)…. beautiful colors…. so relaxing. The only thing that occasionally does is pause for a second or two- like a frame is missing on a tape- every once in a while. Other than that i have no issues. I’d like to see a screenshot of the addition scene or tank on the paid version of the app just to see what it looks like and what fish are in there. I enjoy the fish, it is soothing. Very soothing. Just like having a real aquarium in the room. Love it! This aquarium app is wonderful! I’ve had many compliments on it and share the download information to all! Thanks for this relaxing desktop, especially on stressful days! Really Really Cool!!! Get it!!!! I like to watch it a lot…… it is fun to watch…I see Dorie in the picture!…. it’s very colorful….It makes me happy !!!!!! 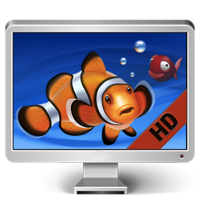 This is a great App, I love watching the Shark and fish swim around Amazing…. This app is very colorful and relaxing. The fish remind me of the colorful fish in Hawaii. Everyone that sees this app loves it. I like it because it is calming. But, the ads are annoying. Thank You Desktop Aquarium for the brilliant idea, you have saved me a lot of money on fish food and maintenance ect. Now how about a bird cage (-: I like it and the kids love it. I enjoy this app as does my cats. Very colorful and realistic images. There is an occassional problem with the app crashing. But easily fixed by just rebooting the app so to speak. Highly recommend! its like having my own fish tank on my desk, love to sit back and watch it. Nice. It looks so real that I can’t pull myself away from it. I don’t want to put other wallpapers up yet. So I can see that it’s gonna be awhile before I can part with this aquarium. It’s awesome! Super Graphics, with a well-chosen loop break, which makes the transition fairly difficult to spot. Very realistic, except the smaller fish would not be hanging so close to the shark anywhere except in an aquarium… Did the sharks bring a menu? Nice visual app. It works and does not bother me in any way. 30s video loop is good for background activity. You may want more if you plan to watch this for a longer period of time. I love this app it needs to have more aquairuim and more different kinds of fishes. The more, the happier I'll be. Thank You. 720p is pretty low quality, don't expect to be impressed. Took it off after a few minutes. Its so beautiful and fascinating I look at it all the time!!!! Great App!!!! This app would be so much better with less fish. It's acutally annoying with so many fish swimming around in a bit of a frenzy. Also, the quality is not too clear on a large screen. Probably better on a laptop.